It’s hard to remember exactly where my novel, Coming Soon: Jubilee Hill Cornfield, started. With a newspaper column? With an accompanying photograph? Or with an oil painting inspired by the photograph? In any case, the seeds of my story were planted in 2009, when I embarked on a tongue-in-cheek project to farm my sunless quarter-acre in the urban services district of Nashville, Tenn. What began as a playful and slightly facetious family activity — chronicled in a column in the Nashville Scene — evolved into an all-consuming solitary writing project. Coming Soon: Jubilee Hill Cornfield is set in the contrasting landscapes of Nashville’s most manicured perennial beds and grittiest community gardens. Writing about horticulture and agriculture inspired more gardening (including illegal urban chicken husbandry), which, in turn, inspired more writing. On sunny days, it was hard to decide whether to work in the fictional garden or in the actual one. Needless to say, I got more writing done in the winter. Anyone who has ever undertaken a large-scale fiction project knows it can be easy to lose sight of the bigger picture, to lose the forest for the trees, so to speak. In my case, it wasn’t a forest so much as a garden bed — a plot, you might even say — of perennials and edibles, which serves as the backdrop for my fiction. Fortunately, whenever I did begin to lose creative perspective, I had something to bring my focus back to center: an oil painting, inspired by a photograph, which accompanied a newspaper column. 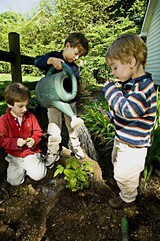 The figures in the images here are my own children, planting their first basil plants in my side yard. Photographer Eric England originally captured the scene to go along with my newspaper column, and I loved it so much, I asked an artist friend to immortalize it in an oil painting. Reuben Torres’s gorgeous portrait hung in my house while I sat at my computer tapping out the pages of Coming Soon: Jubilee Hill Cornfield. 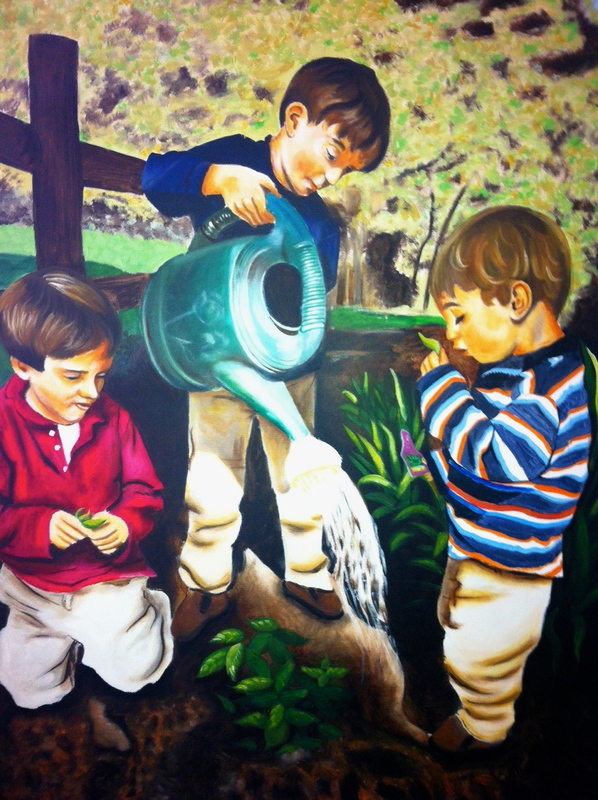 Whenever I began to lose the thread or the voice of my narrative, I looked at the portrait and remembered the concentration and joy my children experienced when tending their plants. Then I could once again imagine how my fictional characters might delight in cultivating their urban garden. And I could put my fingers back on the keyboard and concentrate on the joy of cultivating a newspaper column into a novel.